Drawing 9 shows a head of Bacchus above the jamb: crowned by a wreath of vine leaves and grapes. The Bacchic theme is continued into the freize, with swags of vine leaves and grapes entwining a thyrsus. The Dictionary of ornament defines a 'thyrsus' as a 'Staff with a pinecone at one end, often entwined with ribbons and/or grapevine or ivy leaves. It appears in Bacchic decoration as an attribute of Bacchus, satyrs and Maenads (or Bacchantes)'. The Dictionary of ornament also suggests that 'Bacchus and his attributes were widely used in decoration, sometimes as a symbol of living by the senses to contrast with Apollo who personified reason'. Most commonly, Bacchic ornament was used in dining rooms and would therefore have been designed for one of the residential appartments at the Bank (probably one belonging to a senior figure, given the elaborate nature of the ornament). 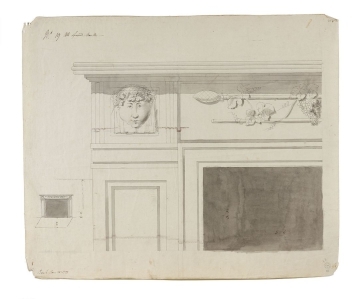 The verso side of (SM 10/8/17, drawing 3 in scheme 1:8) also shows a rough sketch for a chimney-piece with similar Bacchic ornamenet: the head of Bacchus and the vine leaves and thyrsus. The design includes additional ornament on the jambs and fireze section, consisting of segmental arches enclosing circles. The inscription indicates that the main body of the chimney-piece was to be of black marble and a further (cropped) part of chimney piece is shown with a jug moulding in the block above the jamb.